Spring is definitely in the garden even though the temperature is struggling to get above 5C and we are getting (April ?) 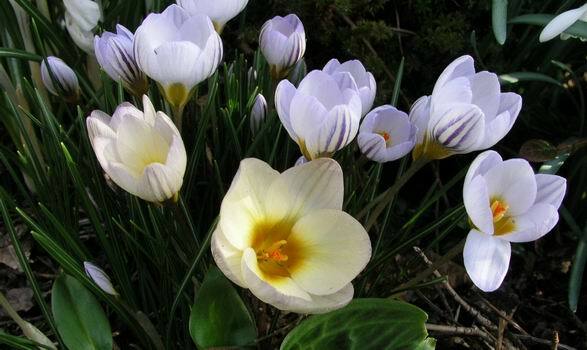 showers of sleet, hail, snow and rain, but, when the sun does shine, the crocus like this sieberi tricolour open their flowers to bask in the sunlight. 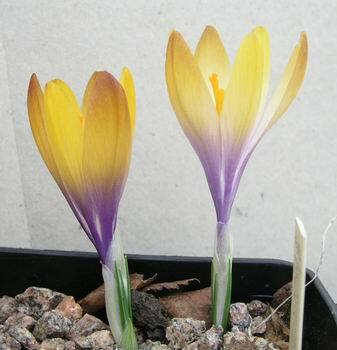 Crocus sieberi tricolour is, for us, a very good garden crocus that takes over when the earlier flowering and also excellent C. sieberi atticus has passed flowering. 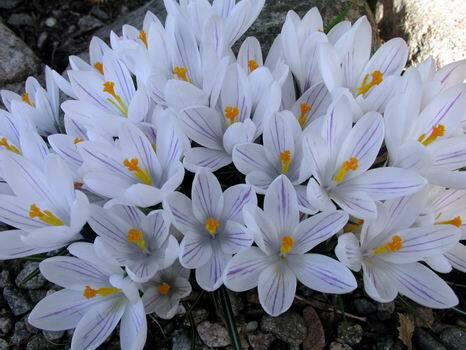 Tony Goode showed a similar form of Crocus vernus albiflorus in the forum this week and it is another of our favourites for the garden as it clumps up well. It is almost pure white but the violet lines just give it that 'edge' as they accentuate the shape of the flower. 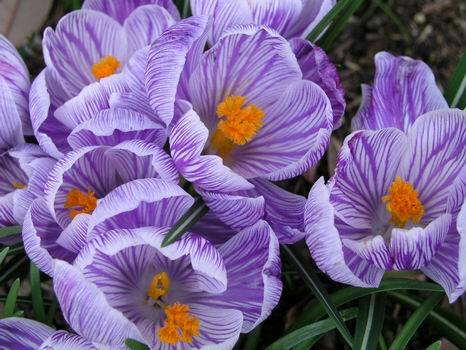 We also like the large 'Dutch' forms of Crocus vernus that you can buy at the garden centres. I particularly enjoy this one with the wonderful frilly style and the striped petals but we also have a deep purple and a pure white one. 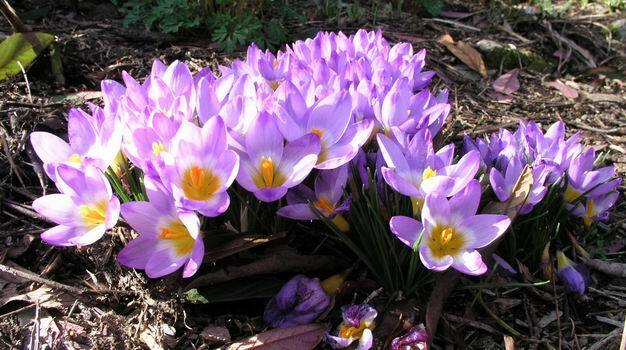 It is always fun when bulbs start seeding around the garden and we have several groups of the Crocus chrysanthus forms and hybrids that we planted many years ago as garden centre bulbs. Some have long since disappeared, obviously Aberdeen was not to their liking, but some have gone on to seed themselves and produce little clumps showing the variation in colour and the lovely flower shape that this group is known for. 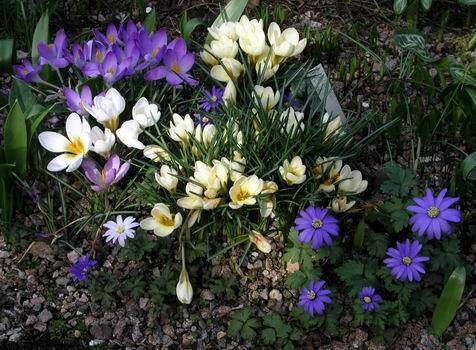 We also enjoy the mixture of spring bulbs as seen here with various crocus flowering along side Anemone blanda, all self seeding happily in one of our 'dump 'em in' beds. In the frame Crocus pelistericus x scardicus is flowering. It appeared in a pot of seed that we had sown from our own garden seed of Crocus pelistericus which grows beside our C. scardicus and they have obviously crossed. Not my favourite crocus, this picture actually flatters it, I would prefer the species. 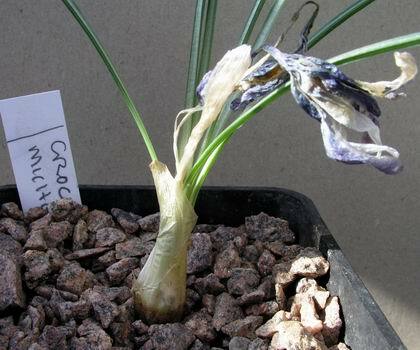 If you look where I have scraped back the gravel at the base of the stem of this Crocus michelsonii you will see a swelling - this is a fat seedpod full ( I hope ) of lovely seed. This is the only way to increase this beautiful and scarce species as it has refused to increase itself for us vegetatively. 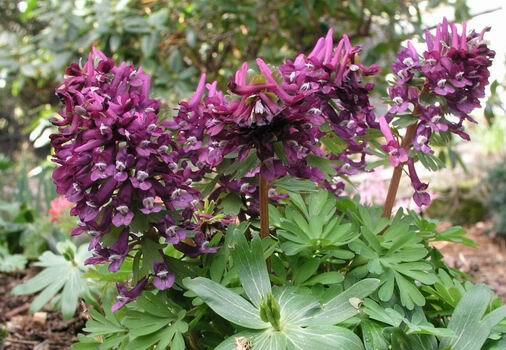 This is also the time of year when the corydalis are starting to make their mark in the garden and they are wonderful garden plants increasing each year both by seed and vegetatively. This is a particularly dark purple seedling that has appeared. I do not usually like the purples as they do not stand out very well but this is quite a nice form because it is so dark. 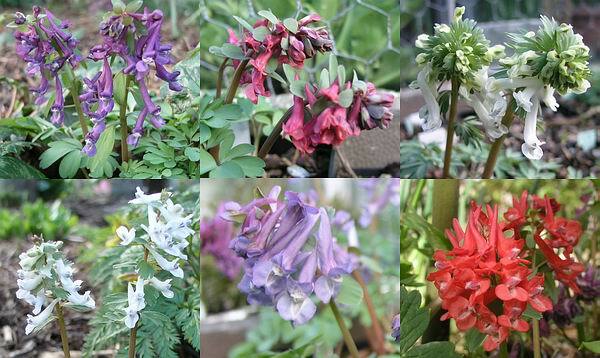 This is just a selection of the other seedlings that we have appearing in the humus-rich beds that Corydalis solida grows so well in. Another of the bulbicodium group, Narcissus jeanmondi, comes from Morocco and is by all accounts another regional variant of N. bulbicodium nivalis. Another name is another excuse to grow another pot full !! 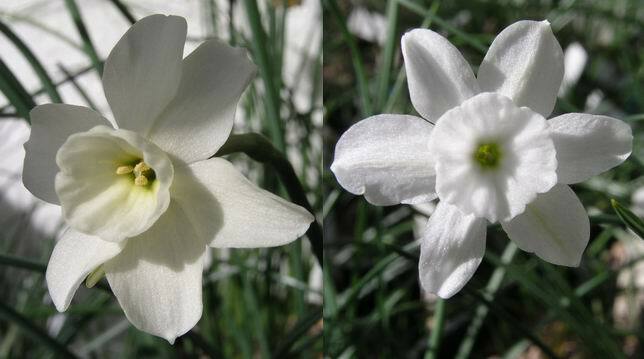 Again coming from North Africa and the Atlas Mountains is the creamy coloured Narcissus atlanticus (left) which is very similar to the pure white N. watieri (right). 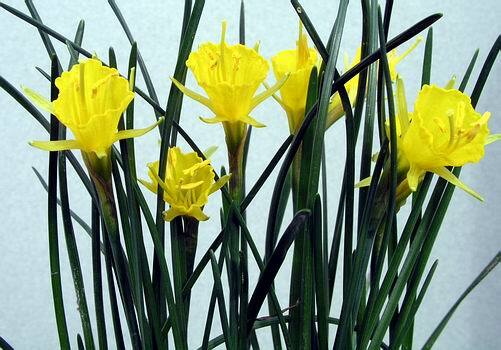 Narcissus atlanticus is much the rarer plant of these two and you rarely see it offered. This scarcity is probably due to the fact that it has been kept going from a single introduction by E. K. Balls in 1936 and until recently no one has rediscovered it in the wild. 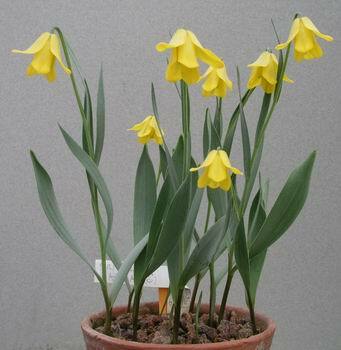 It would be nice to get some seed in from the wild to help maintain the vigor of this rare bulb in cultivation. I will leave you with one of many forms of Fritillaria carica that we grow. They are mostly in shades of yellow, some also having various degrees of brown or green.